It's Your Lucky Day! Free Polish with any Julep.com purchase of $15 or more! You don't have to follow a leprechaun this St. Patrick's Day to find your own Pot of Gold! Shop Julep.com and when you spend $15 or more you can get a free GOLD polish (valued at $14). This is your lucky day! 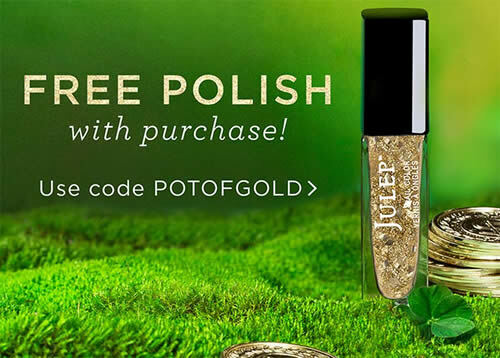 Free gold Julep polish with any $15 purchase - use code POTOFGOLD at checkout. To claim your free polish, add $15 of Julep product to your shopping cart along with one of the polishes on the St. Patrick's Day page. Enter the code POTOFGOLD and the price of your gold polish will be removed from your cart. So which one will you choose? Oscar It Girl? Jane Bombshell? Mahima It Girl or one of the other 12 shades?